Bit by bit, we are making the shift from settling into our new life here to actually beginning the work we came here to do: build a house. Though, to be honest, it’s actually nearly impossible to distinguish between “living life” and “work.” Everything we’re doing to “just" live — making purchases, hosting people, attending church, studying Spanish, navigating (or “nagivating,” as my younger son says) around the island, going to parties, emailing and texting, making conference calls, cooking, going on runs, talking with the postmaster — it’s all part of the process of becoming a member of the community, which, in turn, enables us to better do the work we came here to do in the first place which is, like I already said, to build a house. About that house! The homeowner, an elderly woman with three grown daughters (only the youngest is currently living at home), has been staying in her sister's home since Maria. 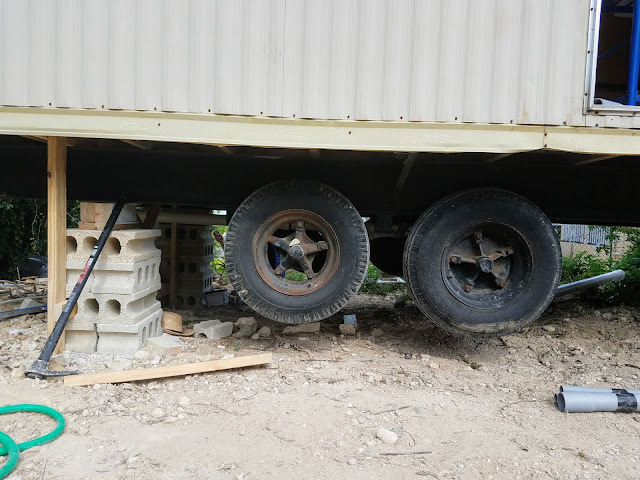 Hurricane Maria so badly damaged their home — only the cement block bathroom (shower, sink, toilet) was left relatively unharmed — that it had to be razed. Over the past couple weeks — one day here, a half day there — we (sometimes with some help from locals) have cleared the property for building, poured the footer for the electrical pole, and laid out the house. Last Friday, the trailer that the volunteers will stay in finally arrived. 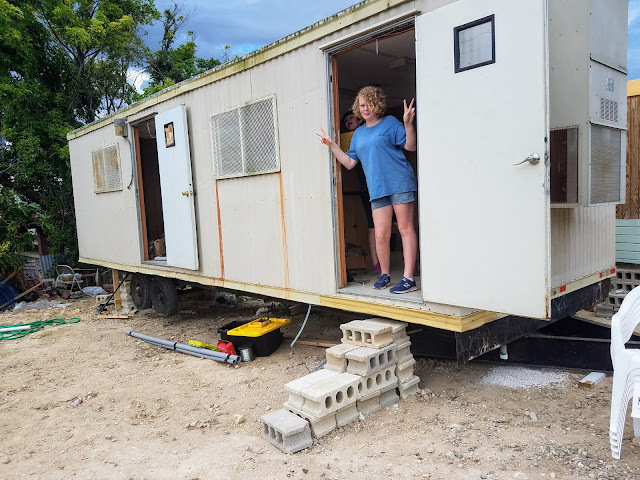 This week is dedicated to getting it ready: getting it level, scrubbing it down and setting up bunk beds and other (minimal) furnishings, installing the plumbing, cleaning (and painting?) the outdoor bathroom so the volunteers can use that, setting up a temporary canopy shelter for shade, etc. Then, finally, we’ll be ready for volunteers — except we won’t because we won’t have electricity for several weeks (the electrical company is terribly backlogged) and we can’t shove a team of sweaty-gross volunteers in a metal box without air conditioning. So that’s still in the works, but no worries — poco a poco we're moving forward. So, now that you know a little more about what it is we're actually doing, how would you like to come volunteer? Because here's the thing: We really, really, really need volunteers. See, MDS’s busy volunteer season is January through April since that’s when carpenters and farmers — their volunteer base — are most available. Summertime, on the other hand, is their slow season with almost no active projects. 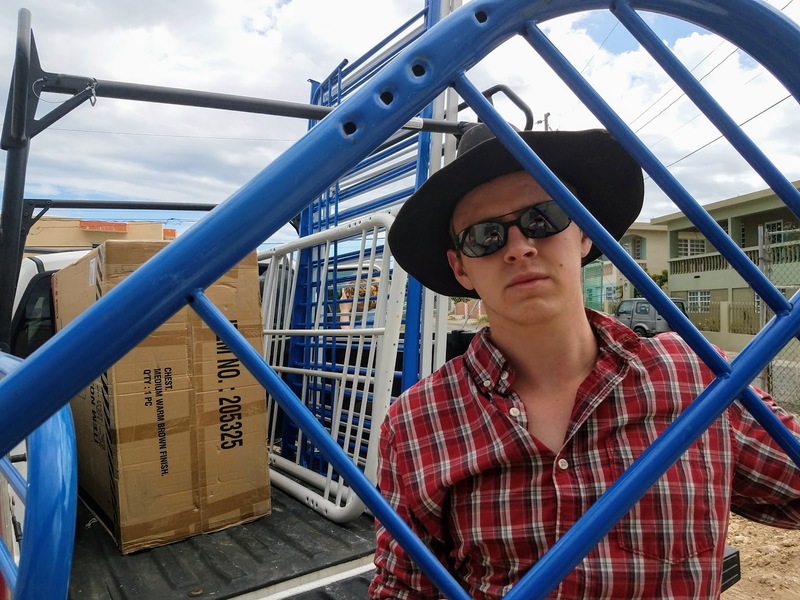 That they are trying to establish multiple worksites in Puerto Rico during the leanest volunteer months, and in the hottest time of the year, is a bit of a challenge. So — good news! — now, in an effort to recruit more volunteers, MDS has decided to pay the cost of plane tickets for all volunteers to Puerto Rico from May 1 through August 25. In other words, you give the time, they cover the costs. As you lunge for your calendars, a few things to consider: Volunteer teams are limited to about five people per team, though you don't have to have a team to sign up. Masonry and block-laying skills are coveted but not required. Males, females, and mature teens welcome. Volunteers can request a particular worksite on the island (Aibonito, Utuado, Ponce), but final placement depends on which site needs what type of volunteers and is ultimately left up to the Puerto Rican coordinators and project leaders. To register, go here. And if you know of people who might enjoy this sort of adventure, please, spread the word! Volunteers are the heart and soul of this whole operation. MDS needs you! This same time, years previous: a few fun things, the quotidian (5.23.16), more on trash, rosa de jamaica tea, rhubarb streusel muffins, strawberry shortcake with milk on top, ranch dressing.